Ever wonder how author John Ronald Reuel Tolkien aka J.R.R. Tolkien dreamed up the ideas that would eventually lead to Middle Earth and the Lord of the Rings novels? Me neither, but we're getting that story anyway in Tolkien, which stars Nicholas Hoult as a hot, young version of the writer before he created one of the most influential fantasy franchises ever. The truth is that we know very little about who Tolkien was, which is crazy when you consider how much of an impact Lord of the Rings and The Hobbit continues to have. 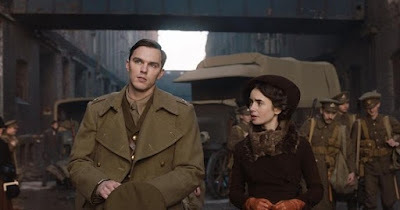 This film, which is directed by Dome Karukoski, tracks Tolkien through his upbringing in the English countryside, which looks a lot like the Shire, to his studies in Oxford and his time fighting in WWI. All of these experiences would form the basis of what he would eventually put on paper, from the exotic locales to Tolkien's views of friendship. That Sam and Frodo bond didn't just emerge out of nowhere. We've seen a lot of movies about authors whose real-life experiences inspired some of the greatest children's novels, and Tolkien looks to be treading similar ground. Lily Collins plays Tolkien's wife Edith, the inspiration for the Arwen and Luthien characters in his Middle Earth novels. Also in the cast are Tom Glynn-Carney, Craig Roberts, Derek Jacobi, Anthony Boyle, and Patrick Gibson. Tolkien hits theaters on May 10th.